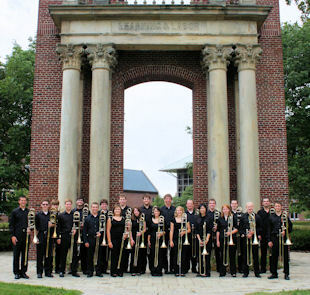 The Universtiy of Illinois Trombone Choir was founded nearly 70 years ago and is comprised of all of the classical trombone majors on campus. The ensemble explores ensemble skills and musicianship through the study of original works and transcriptions from the nearly 600 year history of trombone choirs. Trombone Choir is open to non-music majors on campus by audition. Contact Professor Elliot Chasanov for more information.